Our extensive online catalogue features hundreds of products in many different categories, all made of high-quality materials & offered at prices you can't find anywhere else online! Slimline Warehouse is a national leader in POP, POS, retail, & exhibition displays, offering same day despatch with most in stock products that are purchased by 1 pm EST to anywhere in Australia, including Sydney, Melbourne, Perth, Adelaide, Brisbane, Hobart, Gold Coast, & Canberra! 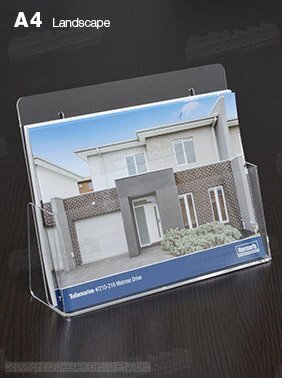 Brochure holder can be mounted on wall or placed on countertop! This acrylic brochure holder is a versatile display with the option of being wall mounted or placed on a countertop! Two keyhole cut-outs in the back make wall mounting simple, with the angled pocket making it easy to grab literature when placed in either position. This plastic literature stand holds A4 (210 x 297mm) leaflets that are in landscape orientation. 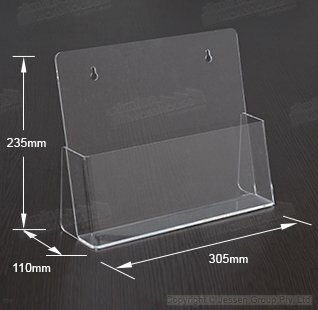 The plastic marketing display, brochure holder is made from clear acrylic to easily see the entirety of the leaflets that are in the stand. 3mm thick acrylic is used that provides durability, with the polished edges giving a stylish look that works everywhere. The pocket of the acrylic literature stands is 37mm deep, providing heaps of space for placing brochures for customers to take! Order today to give information to patrons at trade shows, retail stores, shopping centres, exhibition halls, and more!